THE HAGUE – “I know exactly what the situation is in Curaçao. 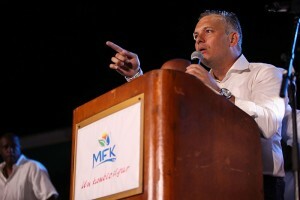 Gerrit Schotte says that all opposing political parties are pro the Netherlands,” said the Minister of Kingdom Relations Ronald Plasterk in a televised interview. According to the Dutch Minister, Schotte still has influence because there is poverty on the island. “More than 30 percent of the population live below the poverty line. “Those people are more open to a charismatic leader,” said Plasterk, The Dutch Minister also said that Schotte handed out gifts to these people for votes. At the end of the interview, Plasterk said that Curaçao’s people are very friendly and easy going. A councilman for the Dutch city of Rotterdam, Joost Eerdmans, was also present during the interview. He called Schotte an idiot and also said that the Curaçao’s political system is completely deteriorated. Plasterk did not react to this statement but said that the only politician who fought against corruption was Helmin Wiels. Wiels was murdered four years ago. Eerdmans said that if Schotte’s party had become the largest on the island, it would have been time to say goodbye. “Curaçao could have left the Dutch Kingdom. The Netherlands cannot force this on them. But I believe that independence would have been very bad for the people of Curaçao,” said Eerdmans.